Powerball dilemma: Lump sum or annuity? 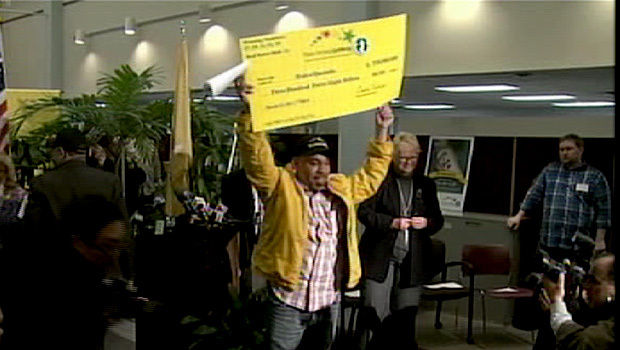 (MoneyWatch) Beating the odds, New Jersey resident Pedro Quezada has won the $338 million Powerballlottery (the numbers were 17, 29, 31, 52, 53; Powerball was 31.) With his financial advisor already hired (let's all hope that it's a fee-only professional, not a commission based one! ), the next big decision is whether to take a lump sum payment or an annuity. The lump sum, after-tax prize would amount to $221 million, or about $152 million after taxes (25 percent federal, 3 percent New Jersey), the fourth-largest jackpot in Powerball history. Most winners take the lump sum, because they want to control the entire amount right away. There could also be a tax edge in taking the lump sum, because most experts believe tax rates are likely to increase in the future as the U.S. tries to reduce its deficit. Investment geeks will note that this is just a variation on a common question: Should people invest a lump sum or use a dollar cost average approach, which involves regularly buying a fixed dollar amount of a given investment? According to research from Vanguard, the answer is clear: two-thirds of the time, investing a windfall immediately yields better returns than putting smaller, fixed dollars to work at regular intervals. Winning $338M Powerball ticket sold in Passaic, N.J. The mutual fund giant analyzed returns from 1926 to 2011 and found that a lump sum portfolio comprised of 60 percent stocks and 40 percent bonds over rolling 10-year investment periods beat dollar cost averaging by 2.3 percent. In other words, if you invested $1 million all at once, after 10 years it would lead to an average ending portfolio value of $2,450,264. Dollar cost averaging would yield $$2,395,824. In the case of the lottery, the differential between investing the lump sum and waiting for payments and then investing them over time could be even bigger, since the annuity would be based on a guarantee. That essentially means that the winner would be trading potential upside return for the comfort of a lower, guaranteed stream of income. Of course, if the lump-sum decision were to occur at the beginning of a terrible 10-year period for stocks, the investor may not be better off. Vanguard's study notes "risk-averse investors may be less concerned about averages than they are about worst-case scenarios, as well as the potential feelings of regret that would occur if a lump-sum investment were made immediately prior to a market decline." There's also the risk that anyone who receives a windfall could blow the money before it ever gets invested into a balanced portfolio. Don McNay, author of the book, "Son of a Son of a Gambler: Winners, Losers and What to Do When You Win the Lottery," says that nine out of 10 winners go through their money in five years or less. "It's too much, too fast," he says. "Nobody is around them putting the brakes on the situation." After all, the stream of income is a huge number in and of itself. The Powerball annuity payout schedule consists of 30 annual payments that increase over time. The starting amount would be just shy of $4 million after taxes and the last payment would be about $12 million. Not too shabby!